Christy Brown: Why did you say you loved me? Dr. Eileen Cole: Because I do love you. Christy Brown: Ay, you mean platonic love. I've had nothing but platonic love all my life. Do you know what I say? F*** Plato! F*** all love that is not a hundred percent commitment! There's a primal current that radiates throughout My Left Foot, an Irish film of humble origins—not just in terms of its subject matter and budget, but also in that its makers were making their cinematic debut with it. If a major Hollywood studio had undertaken the story of Christy Brown, a Dubliner born with severe cerebral palsy, this would be a different film, and not for the better. Director Jim Sheridan and his co-writer, Shane Connaughton, do not approach their subject with any pity and will not allow the audience to pity him, either. Christy (played as a young boy by Hugh O'Conor) is one of a dozen children in the meagre Brown household. His father, Paddy (Ray McAnally), works as a bricklayer and towers with parental authority at home, while his mother (Brenda Fricker) balances the family dynamic with love and warmth, each of which is devoid of sentiment. The family is integral to the story, for Irish life is intimately tied to often large families. One of the most triumphant elements in My Left Foot is how it invites the audience into the Brown's dwellings, making us another child alongside Christy and his siblings. The script is full of acute insights into Irish life, ranging from a scene when the young boys look at a dirty magazine to a soccer match on the concrete streets of Dublin. The heart of the story, however, centers on Christy. The cerebral palsy has wrought such damage on his motor skills that only his left foot is functioning. Eventually the "crippled" Christy proves to all that he is a true genius, starting with him writing a simple message in chalk on the floor. Anguished by physical effort, Christy spells out perhaps the most important words in his life: MOTHER. Few scenes affect me the way this simple one does, from Christy's labor of love to his mother's tears of joy to his father's buoyant reaction. Sheridan directs it without any sensation, allowing the characters to express themselves naturally and slowly, as the scene evolved before our eyes. The scenes of a young Christy lead to him as a teenager (now played by Daniel Day-Lewis). The family suffers many hardships, with an unexpected pregnancy and the father being laid off, at the same time that Christy becomes increasingly isolated. He tries for the affections of a pretty neighborhood girl, only to be rejected. Left alone with his mother, Christy can barely articulate himself vocally, but learns to use his foot as a tool for painting. Soon he works with Dr. Eileen Cole (Fiona Shaw), who teaches him to speak and utilize his body to the best of his ability. Unfortunately, Eileen fails to see how her relationship to Christy moves beyond the confinements of a patient-doctor social situation. Christy falls in love with her, only to be rejected in public when Eileen announces her engagement. The scene is one of the most devastating I have ever seen, especially since it is contrasted with the success of Christy's artwork. All of the emotions, both the sorrowful and the triumphant, flow forth with unbridled enthusiasm. The story of Christy Brown is one that chronicles the beauty of human life, no matter how dark and imprisoned it may appear to be. Sheridan's cast is intricate in capturing this theme, with standout work from all on the screen. Day-Lewis and Fricker both walked off with well-deserved Oscars (though Fricker's role is anything but supporting, contrary to what the Academy says). This is likely the best performance from Day-Lewis, which is an impressive feat for an actor of such consistently excellent work as his. He sears into the role of Christy, living it and making the audience live it. The physical accomplishment of turning himself into a cerebral palsy patient is the least of his accomplishment, for he delves deep into the essence of Brown. Unlike Tom Hanks' turn in Forrest Gump, Day-Lewis makes us believe that he is not acting, but truly an incarnation of Christy Brown. The opening scene, in which he looks directly into the camera, speaks volumes without Day-Lewis saying a single word. Fricker is also just as impressive, in her patient performance filled with love and hope. Her portrayal of Mrs. Brown is the embodiment of motherhood, letting the viewer see Christy as if we are his mother. While not enough can be said of the two leads, Hugh O'Conor's performance as the young Christy is also worthy of high praise. He establishes the ground on which Day-Lewis bases his performance, and in some instances actually surpasses the elder actor. The joy conveyed by O'Conor when the family pushes him in his wheelbarrow captures an innocence and truth that adult actors simply cannot achieve; they are too caught up in technique. The exuberance in O'Conor's portrayal is simply magical. Ray McAnally is also effective as the stern father, bringing a warmth to the turn in key scenes while never letting the character fall into a clichéd father. The performances are so powerful that they make all the other feats of the film seem secondary. The script is sharp and treats its subject with respect. While Elmer Bernstein's score is minimal, it helps to heighten the emotion and opens up the world of Christy Brown to the audience. Sheridan's direction employs authentic visuals that cement the extraordinary life of the story's subject in reality. There are many more technically accomplished films than My Left Foot, but few use the cinema as a effectively for revealing human truth. Truth. That's an interesting term, for it assumes absolutes in this constantly changing world. If nothing else, the life of Christy Brown reminds us of one undeniable truth: life is worth living. Image Transfer Review: After years of only being available in pan-and-scan, My Left Foot gets its due with a new digital transfer preserving its 1.85:1 original aspect ratio. The anamorphic transfer does have some dirt on the picture during the first part of the movie, but it accurately reflects the gritty texture of the cinematography. Detail is excellent, as is contrast and the rich blacks. Colors are strong, but the subdued color scheme of the movie does not make for an especially dazzling picture in that regard. Depth is also strong throughout, helping to create a filmlike look on the DVD. Some print defects exist, but nothing is distracting. Excellent work! Audio Transfer Review: The newly created Dolby Digital 5.1 starts out promising, with a nice amount of rear-channel activity during the opening scene. However, it soon becomes apparent that this is a front heavy mix, with scenes such as at Christy's gallery premiere failing to capitalize on the surround sound. Bernstein's score gets some use of the surround speakers, however. Directionality and separation are not noticeable, though I actually prefer this because it feels better suited to the material. Dialogue is audible and the audio is quite crisp, however. There's also a French Dolby Stereo 2.0 mix available. Still Gallery—a collection of still photographs from the film. 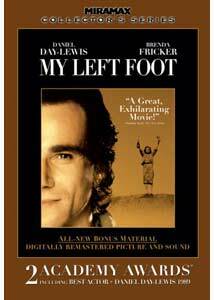 My Left Foot Reviews—four complete reviews from the film's original theatrical release, reproduced on the DVD. Extras Review: Unfortunately, it appears that director Jim Sheridan had no involvement in this DVD. As a result, he does not provide an audio commentary and if you've ever heard his other commentaries, you'll understand why I lament this. However, the features here, although brief, are welcomed inclusions. The Real Christy Brown (04m:39s) is a quick introduction to the thoughts of co-writer Shane Connaughton and producer Noel Pearson about the man. It has some actual movies of the real Christy Brown and his mother, which is interesting to see in comparison to the actors' performances. The two filmmakers discuss their own acquaintances with Brown, touching upon his personality and work ethic. The second featurette, An Inspiration Story: The Making of My Left Foot (10m:12s), quickly chronicles the movie's story from inception to American critical reaction. Actor Hugh O'Conor and some film historians join Connaughton and Pearson, giving some keen insights and interesting anecdotes. It's quite brief, but still manages to pack a lot of material. Next is a still gallery, featuring still frames from the film as well as a single publicity still of Day-Lewis. Four selected My Left Foot Reviews are reproduced in full on the disc, with their original publication date and relevant information. Charles Chamblin's review can more accurately be called a promotional piece, but the other three (especially David Denby's) are excellent analyses of the movie. All four are well written and offer different (positive) views of the film. The final supplemental material are the trailers for Miramax: 25th Anniversary, Dear Frankie, Bride & Prejudice, and Prozac Nation . Each is shown in 1.33:1 full screen and Dolby Digital 5.1 audio. The extras are brief, but the featurettes are quite impressive. A bravura film, My Left Foot excels on the basis of its story, actors, and director Jim Sheridan. At long last the movie is shown on home video with its original aspect ratio, which is worth the double dip on this disc alone. The new Dolby Digital 5.1 audio and special features also contribute to this elegant DVD.